For those of you unfamiliar with the Aeropress, it is a wonderful, compact single cup pressure brewer. This fantastic hand brewer requires only human pressure (no electricity), fresh coffee grounds, and hot water to brew a delicious cup. Another great thing about Aeropress is that it makes the perfect travel companion! Lightweight and durable, you can take this magical little brewer with you wherever you go. Materials needed: An Aeropress brewer, hot water, and ground coffee. Aeropress brewers are designed to accommodate any grind type. 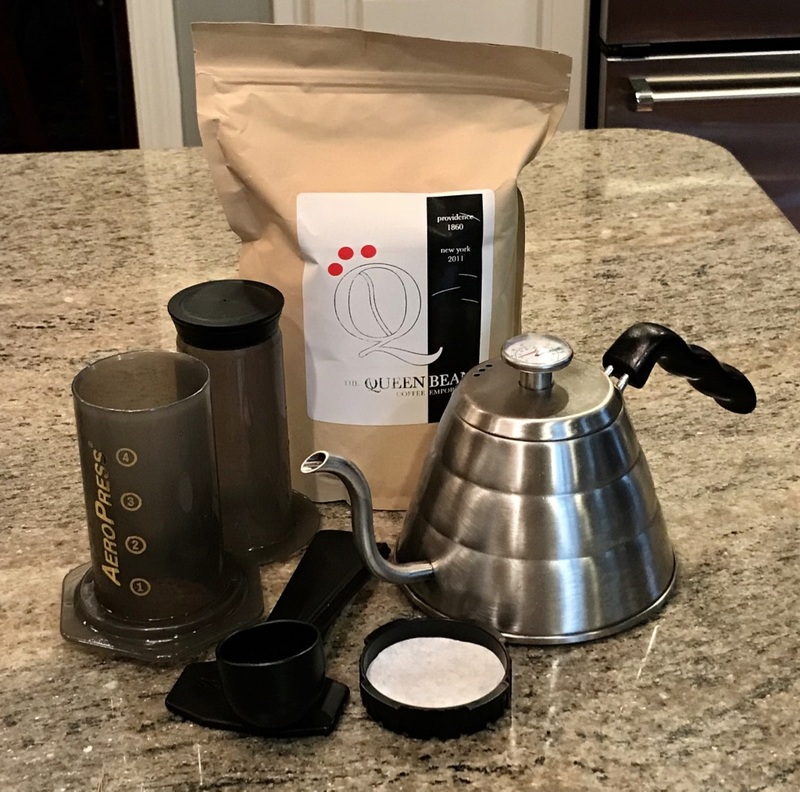 At TheQueenBean, we use a drip grind but any grind will do — finer grinds will make the brew stronger while larger grinds will reduce the coffee’s strength. Step 1: Place your filter in the filter holder and secure it to the base of the brewer. Step 2: Add your ground coffee to the beaker. We recommend using 1 heaping Aeropress spoon full for every 6 ounces of water. If you enjoy adding a little spice to your cup, this is the perfect time to add that shake of cinnamon, pinch of chocolate, or other great add-in to your grounds. Step 3: Boil your water until it reaches between 195-205o Fahrenheit. Pour the hot water over your coffee grounds. If your kettle does not have a thermometer, bring your kettle to a boil, remove it from the heat, and let it cool for 5 seconds before pouring the water over your grounds. Step 4: Wait 10-15 seconds and then stir the grounds gently for 3-5 seconds to ensure full emersion. Once stirred, leave the grounds to steep for 1 minute. If you prefer your coffee a little stronger, you can let it steep for 2 minutes. Step 5: Gently, slowly depress the plunger until it is fully contained in within the base of the Aeropress. Step 6: Enjoy your coffee! 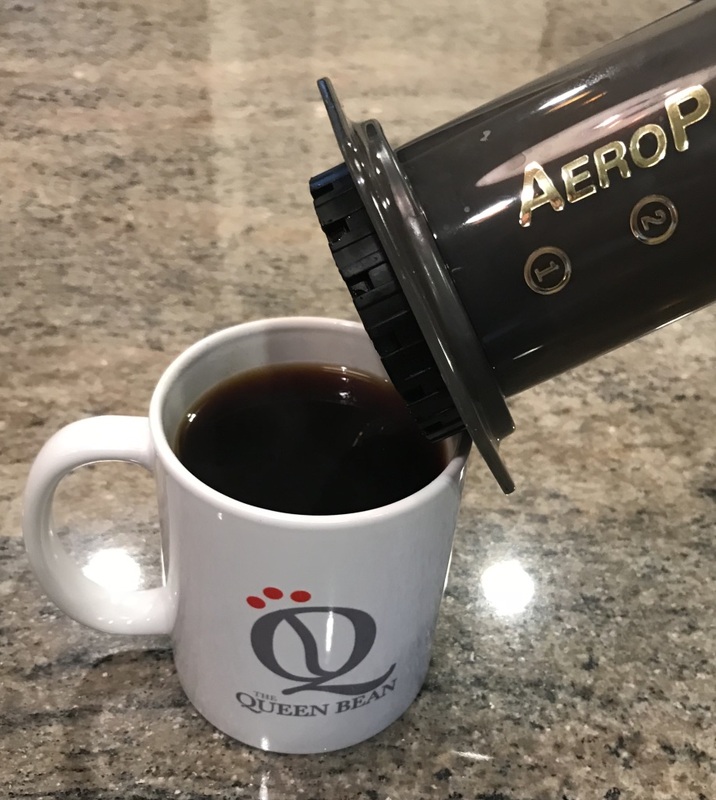 For additional information on the Aeropress and other brewing methods, check out our blog entry.